If you were a fan, then you don't need me to tell you that The Jam were a top quality Punk/Mod revival band fronted by Paul Weller, and were active during the late 1970s and early 1980s. They achieved no less than 18 UK chart hit singles. 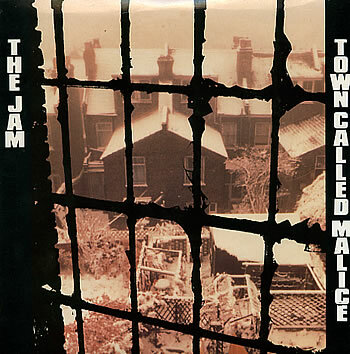 Released on 29th January 1982, "Town Called Malice" entered the charts at No.1 in the UK (the band's third chart-topper) and remained on top for three weeks, with "Golden Brown" by The Stranglers at No.2 for the first two weeks (they must have been pretty annoyed at never reaching #1), and "The Lion Sleeps Tonight" by Tight Fit at No.2 during the third week. Tight Fit reached #1 on 28th Feb when The Jam slipped to #3. The single was released as a double A-side with Precious. The lyrics (written by Paul Weller) reflect upon the issues of the early 80's such as unemployment, alcoholism and trying to survive in a town (Woking) with no work or facilities under a Tory government - they're still just as relevant today then! The song was lifted from the band's sixth and final studio album The Gift which topped the UK album charts. At under 33 minutes long, The Gift was a relatively short album featuring funk and bass influences. "Town Called Malice" has featured in several big movies, including National Lampoon's Euopean Vacation (1985), Billy Elliot (2000) and The Matador (2005). The song also featured on the soundtrack in the video game FIFA Football 2004.